A graduate member of the Tomahawk High School Class of 2004. Josh was a four year member of the football, wrestling, & baseball teams, earning eight letters as well as ten All Conference honors. In football, Josh was a two time letter winner as well as a two time All Conference First Team athlete on both offense and defense. He was also the Lumberjack Conference Offensive Player of the Year as a senior. Josh was voted Most Valuable on both offense and defense. He holds the single season touchdown record of 21 as well as a school career record of 27 touchdowns. Josh was selected as the Channel 9 Athlete of the Week for his outstanding efforts. As a baseball player, Josh earned two letters and two Honorable Mention All Conference honors. He was also selected as the Most Valuable Player on defense. However, it was in wrestling that Josh shined. He earned four letters and four All Conference Honors. Josh was a three time conference champion, four time regional champion, three time sectional champion, four time state qualifier, three time state place winner, three time state finalist, and one time state champion. He was selected twice as the Most Valuable wrestler, and he participated in the Wisconsin/Minnesota All Star Classic his senior year. Josh was also selected as the Channel 9 Athlete of the Week, and he was a three time Channel 9 First Team All Star Wrestler. His high school record was 161-11. In addition to all the above mentioned honors, Josh was voted as the WIAA Scholar Athlete, winner of the Jim Taylor Award, Don Dorski Award, & Gary Kuntz Award. After high school, Josh attended UW-LaCrosse and set his mark on their wrestling program. 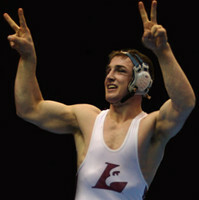 Josh was a four time All-American placing sixth as a freshmen and third as a sophomore before becoming a two time National Champion at 174 lbs. He boasted a career record of 153-24. Josh was just the third UW-LaCrosse wrestler to earn All-American honors all four years. He was a three time WIAC champion, named the 2008 Max Sparger Wrestling Scholar-Athlete, and a three-time Academic All-American while carrying a 3.55 GPA.